Next stumbling block for the Euro: Inflation. 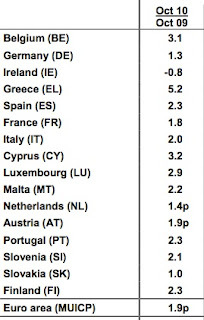 According to Eurostat Eurozone consumer prices rose 1.9% YOY (pdf) in October (September 1.8%, October 2009 minus 0.1%) and came close to the European Central Bank's inflation target of 2%. This is the highest value in 2 years and contradicts EU Commission president Jose Manuel Barroso who said only a day earlier that the Euro is a stable currency. Oil's recent spurt to $88 and coming higher taxes in context of the austerity packages that will be felt in 2011 guarantee a further steepening of the inflation curve. The lowest annual rates were observed for communications (-1.1%), recreation & culture (0.1%) and clothing (0.4%). 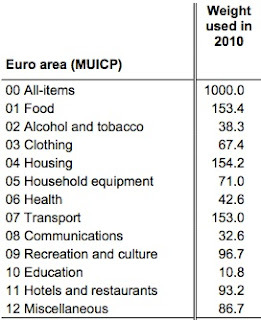 Looking at index weightings I doubt that Eurostat's basked of goods and services reflects actual spending of households. Eurozone households definitely spend more than only 15% of their income on housing. I would be happy if only 46% of my expenses would go into housing, transport and food. 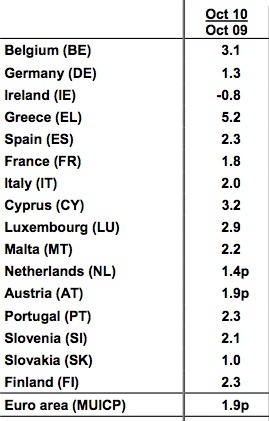 While Germany ranges still at the lower end with 1.3% annual inflation this can be expected to rise faster next year. German health insurers have already announced an average 7% hike in premiums and this is a trend seen in so many other sectors too. We can conclude that the Euro's value is now under double attack. EU politicians have yet to come up with a single piece of regulation for the banking sector that would punish excessive risk taking and unstoppable food and energy inflation will add more pressure on the single currency.